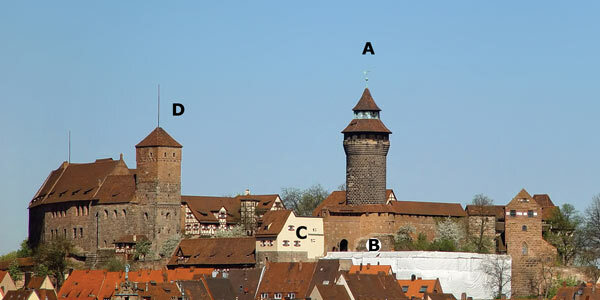 For those not familiar with the architecture of the Kaiserburg in Nürnberg, the following images should help. The first is a photo borrowed from the GermanWiki site, and the second a screen-shot from Google Earth. I labeled the four principal viewpoints discussed in the discussion pages of this section. C. Private Building on the old wall. In the Sinwell tower (A), the public is not allowed to go higher than the lower circle of windows shaded by the larger roof. Notice that these windows are not that much higher than those in the (D) Heathen's Tower. The Building (C) is considerably lower than either tower and not a whole lot higher than the (B) Observation Platform. It was initially surprising to me that just the small lateral distance between the Sinwell Tower and the B) observation balcony causes a appreciable shift in the lateral perspective of the city view. The Heathen's Tower is attached to the double chapel (upper and lower). It is called "Heathen" because of the presence of pagan and Renaissance decorations, most of which were apparently removed. The designation "Square" is my own. 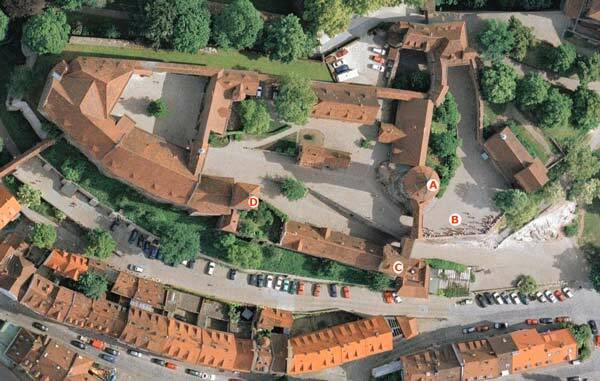 The Building C may be located above the old stables along the entrance to the Castle through the "Heavenly Gate." I do not know its history or function. 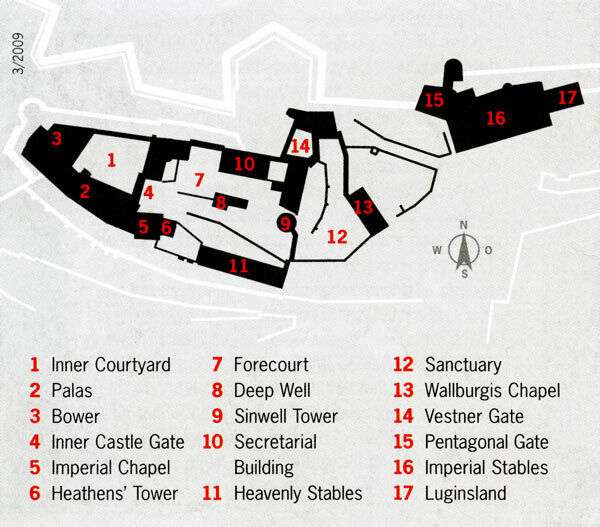 I take the liberty of reproducing a plot of the Castle layout from the Museum's brochure. I recommend a visit.